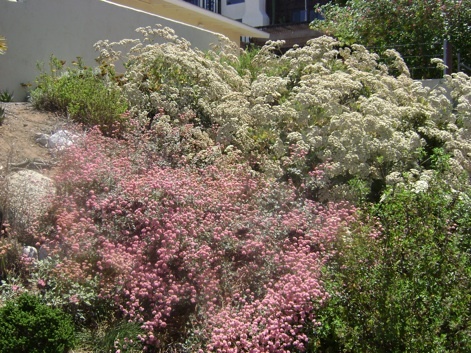 E. g. r. in front with pink flowers gets about a foot tall and spreads a few feet, endemic to the northern SoCaL islands. E. gig. 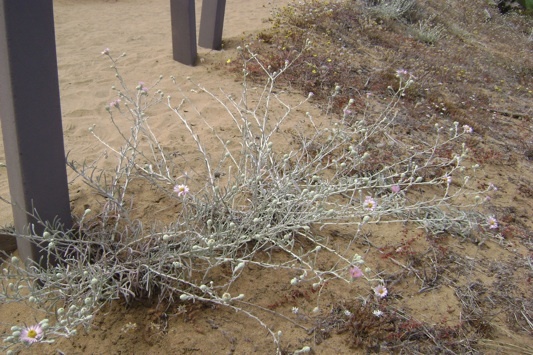 in back with white flowers gets 4 to 8 feet tall and a little wider, largest species of the genus, endemic to southern SoCaL islands. Both bloom Spring to Summer. Location in Ocean Beach / Pt. Loma. Picture at top is a wild form at Torrey Pines park, Cor. fil. ssp. linifolia. 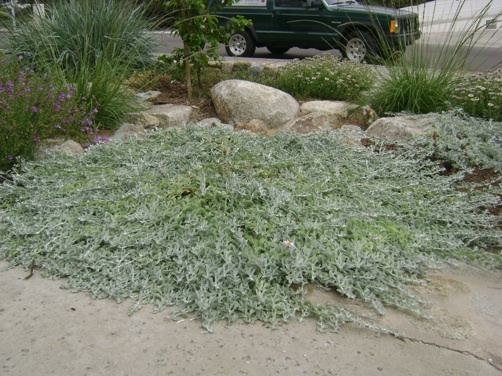 Lower photo is a selected cultivar of the basic species 'filaginifolia', called 'Silver Carpet', which was found along the Big Sur coast. Main bloom Spring to Summer, though can bloom longer. The subspecies 'filaginifolia'(Cor. fil. ssp. filaginifolia.) is native to the SoCaL islands. Grindelia stricta platyphylla, grows about 6" tall by a few feet wide, blooms Summer into Fall, native to the northern channel islands, as well as central and northern coastal California. 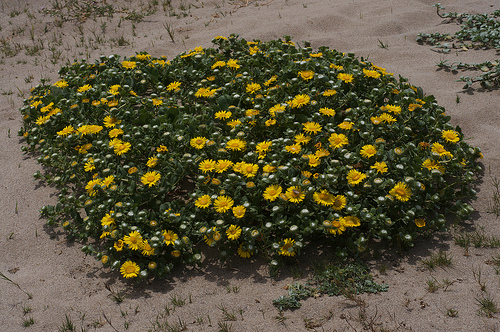 Native to beach areas typically in regular sandy beach soil on the mainland and islands, though can grow in sandy loam soil too, and some heavier soils fairly well. Blooms year-round. Takes regular irrigation, which is necessary for good appearance and abundant Summer-Fall bloom, but survives on rainfall alone in the wild, and in moderate domestic situations. Low and spreading usually, though there are some variations. 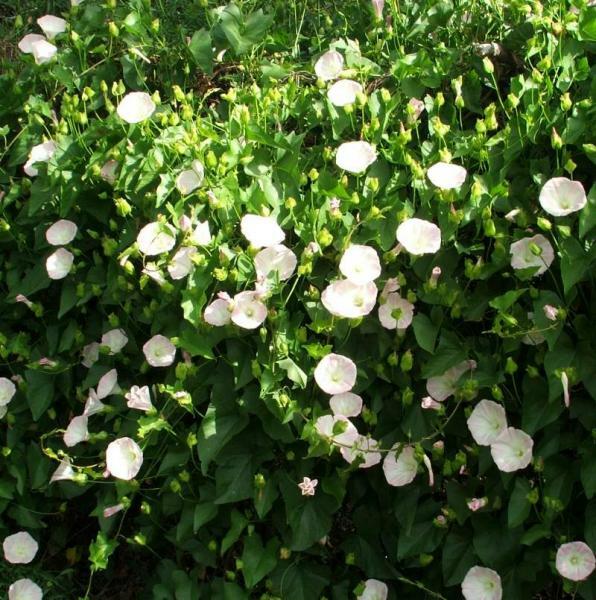 Vine native to Anacapa Islands(this particular variety of the species), grows abundantly with light pink blurred into white flowers. Blooms for much of the year. 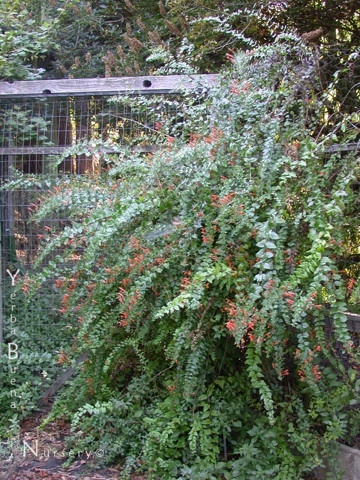 Blooms in Summer, greyish lacey foliage, foliage and bloom structures are somewhat reflective to 'Fern Leaf Lyonothamnus'. Blooms whitish, fading to brown. Gets around 3 to 5 feet. Native to Limu, Wimat, and Anyapax. Bush Penstemon(Keckiella cordifolia), sprawls to around 5 foot +, growing into and through other shrubs with it's semi-viney growth. Red-orange flowers, blooms Spring-Summer. Does best with moderate water throughout the year. Best in part shade or continually moist full sun. 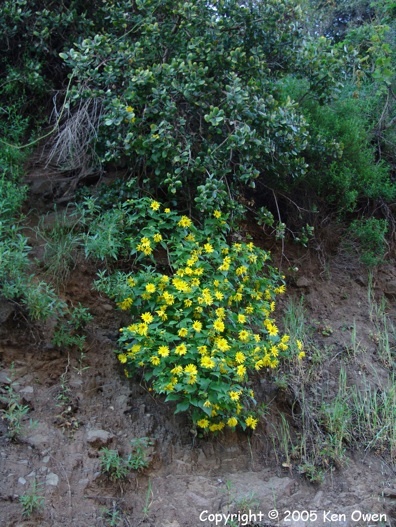 Native to Wimat, Limu, Pimu, and a broad range on the mainland, in the more protected and moister areas such as north slopes, drainage gullies, canyon bottoms, and mountains. 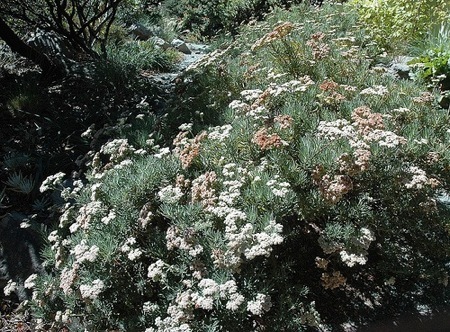 Gets a few feet all around, blooms late Winter through Summer, with adequate moisture. 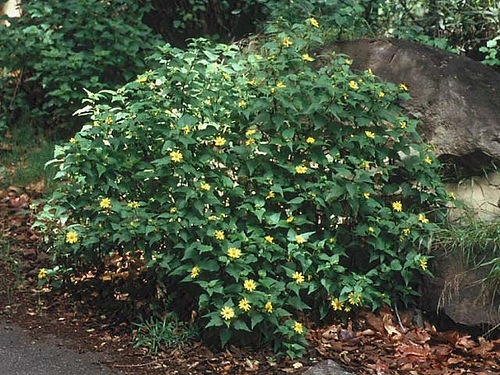 Does well in bright shade as well as moderate sun; needs moderate water throughout the year to keep it looking best. Uncommon; native to Wi'ma, Limu, and much of the Southern California region in occasional protected drainage ravines/gullies and north slopes that don't have much competing vegetation. 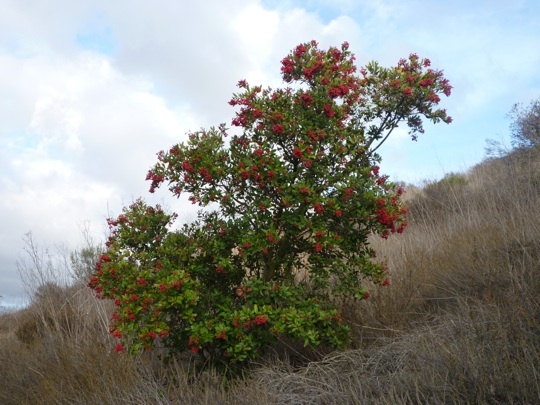 Native to much of the SoCaL region westward of the mountains, including the islands, Toyon(Heteromeles arbutifolia) gets around 6 to 15 feet +, depending on water and location. White blooms in Summer to Fall, red berries in Fall/Winter. Aka, California Holly, aka Hollywood, hence the name of Hollywood, California. 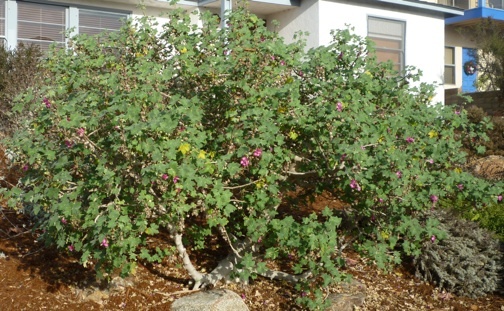 (Click on underlined title to see more) Island Tree Mallow(Lavatera assurgentifolia), Northern Channel Islands endemic, from Tukan to Anyapax, related to Hibiscus. Deep pink flowers are the usual offering. Blooms most of the year.